Brandon Schmitt takes his oath of office to become the newest board member. 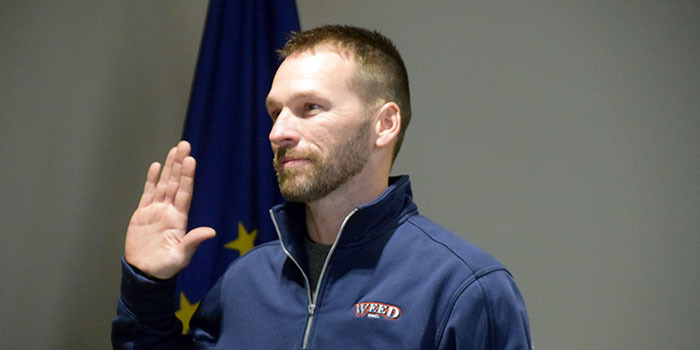 WARSAW — The Warsaw-Wayne Fire Territory Board welcomed Brandon Schmitt as their newest board member during the meeting held on Tuesday, Feb. 5. Schmitt replaces Joseph Streeter, who resigned in December after moving out of the territory. Schmitt began his service with the Warsaw-Wayne Fire Territory in 1997 when he joined as a volunteer firefighter. He was then a career firefighter for the department from 2001 until 2016, when he left to help run his family business. Fire Chief Mike Wilson provided a summary of 2018 to the board. During the year, 2,506 emergency response calls occurred, with 1,763 involving traffic accidents with injuries, medical calls or rescue type calls. Of all the calls, only 4.2 percent, or 106 calls, were fire related. The board recommended approval to start the process to purchase a replacement for squad 13-4. The department will now acquire the cost of the replacement apparatus as designed. To find the costs, the department is using Sourcewell, an approved purchasing agency. This eliminates the need for the department to advertise and receive bids on their own, which saves time and money. The replacement apparatus has already been approved in the 2019 budget for a not-to-exceed amount of $750,00. The board then approved an installation and service agreement with Safe Haven Baby Box. The proposed baby box will be installed on the west wall of station 2, which is located at 2204 E. Center St. The city will be responsible for installing the alarm system for the box, but Safe Haven Baby Box will be the owner of the box. Right To Life of North Central Indiana raised the funds to purchase the box. The contract will go before Warsaw Common Council on Feb. 19. The board also approved for the department to provide the training, distribution and documentation of Naloxone (Narcan) if the county receives the 2019 Naloxone Rescue Kit Grant for First Responders. The county received the grant last year. Wilson noted that there were 40 overdose deaths in Kosciusko County in 2017. Wilson and the department will be in charge of distributing doses of Narcan to any fire, police or EMS agents in the county who use their current dose or if their dose expires. Last year, the Kosciusko County Sheriff’s Office handled this role but requested that the fire department take over this year if the grant is received.